Founded in 1863, Frye is committed to creating iconic leather goods, using the best materials, craftsmanship and design. 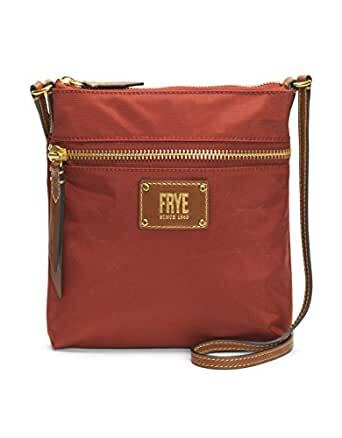 This nylon zip cross body with antique pull up leather trim found on our Melissa bags, is the perfect lightweight and durable bag from Frye. Details: Zipper closure, 1 front zip pocket, 1 exterior back sleeve pocket, 1 interior sleeve pocket, adjustable leather strap, Frye logo with rivets, PU coated interior for easy cleaning. Measurements: 10”W X 10.5”H X 1”D, shoulder drop 22.5”.